That's not a dog in a Nintendo sweater. You are looking at groomed, dyed, and trimmed dog hair. Let's call this pooch "Yoshi Dog." Recently, the Intergroom dog grooming convention was held in New Jersey. 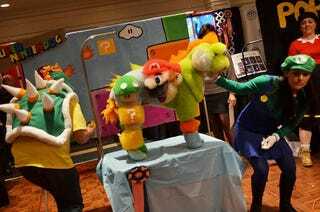 Courtesy Buzzfeed (via GoNintendo) are these photos of a Nintendo themed-grooming from a creative challenge competition.